Many systems exist for community formation in extensions of traditional Web environments but little work has been done for forming and maintaining communities in the more dynamic environments emerging from ad hoc and peer-to-peer networks. This paper proposes an approach for forming and evolving peer communities based on the sharing of choreography specifications (Interaction Models (IMs)). Two mechanisms for discovering IMs and collaborative peers are presented based on a meta-search engine and a dynamic peer grouping algorithm respectively. OKBook, a system allowing peers to publish, discover and subscribe or unsubscribe to IMs, has been implemented in accordance with our approach. 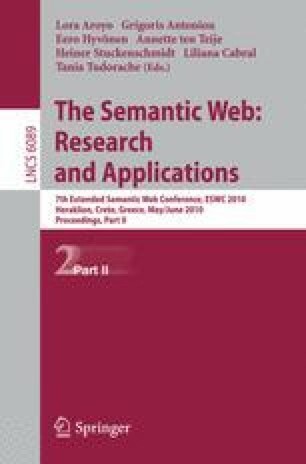 For the meta-search engine, a strategy for integrating and re-ranking search results obtained from Semantic Web search engines is also described. This allows peers to discover IMs from their group members, thus reducing the burden on the meta-search engine. Our approach complies with principles of Linked Data and is capable of both contributing to and benefiting from the Web of data.